The Qatar Stock Exchange’s (QSE) general index slipped 0.72% early Monday to 13,366 points, losing 75.5 points by 09:46 am Qatar time. 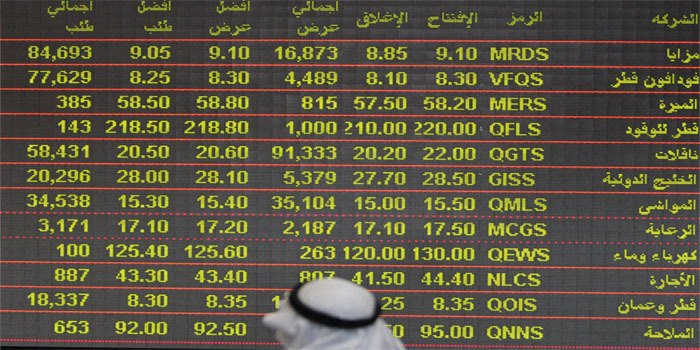 The industrial sector topped the QSE’s losers with 0.57%, while the telecommunication sector led winners with 0.46%. Qatar Industrial Manufacturing’s stock headed top decliners with 5.93%, while Qatari German for Medical Devices led rising blue-chip stocks with 2.7%. Turnover amounted to QAR 10 million after 570,000 shares were traded through 450 transactions. United Development’s stock, up 1.4%, led the bourse in terms of trading volume and value after nearly 190,020 shares were traded, generating QAR 3.03 million in liquidity.